You spend all that time creating a blog and website, the least you could do is to make it pretty. I’m not talking about wrapping a bow around it but if that’s your thing, make it look good. But what I AM talking about is making your site look good. Fess up, the majority of your readership isn’t reading every word. While we hope that they do and maybe they might need to… they just aren’t. 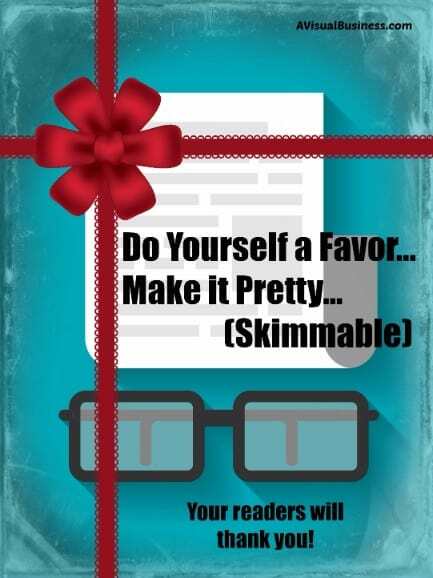 So, now that you have faced the facts about that, make your content reader friendly and by that, I mean… “skimmable”. If you make your blog skimmable then your readers can skim it for the important parts (to them) and read the parts they want. After all, we would be happy that they read it all, and if not, as much as possible. How can we make it pretty (read: skimmable)? C then A must be to C …. well, you know what I mean. So how do we do this? Headings – these are easily done using heading tags like h1, h2 and etc (see the above text that breaks the paragraphs out, those are heading tags). Of course you can bold the text but heading tags tells the search engines it’s important. Styles – sure you can use the above, but sometimes you want to emphasize a point or word and that can be done with a colored text, bold or underline. Just be consistent and don’t get carried away. Keep in mind that most consider underlines as links, so I just like to bold text, like I have in this list. Don’t go overboard and bold too much though. White space – often, writers are afraid of white space, but don’t… it gives the readers’ eyes a break. We could all use a break, right? Plus, it helps with break up the text too. That’s pretty much the basics for making your website readable. Next step is to make your website search engine friendly. Should you have any questions about search engine optimization, contact me, as I would be happy to help! Let me know how you kill it with your blog skimmability (yep, that’s a word! lol) in the comments below. I know. We all want everyone who visits our websites to read every word. But it doesn’t happen. If the site isn’t easy to skim, they will click away pdf – pretty darn fast. If the text is too dense and all the same, they’re gone. Your suggestions of varying with bolding, headings, images, white space and bullets make all the difference. Yea, we can only hope, right Beth. Doing these things will surely help. I totally do this, skim. There is so much to read. I probably read 1 of every 5-7 blogs post I look at. Your suggestions help me know if I want to take the time to read it. Yep Karen, I do too…. as do the majority, I am sure. This helps get more of it read. I knew you could relate to that Jackie. I think the word ‘skimmable’ is going to be part of my blogging mantra for 2016 as well. Thanks! From now on I’m going to leave the comment, I read or skimmed all the way to the bottom. That would be fun Roz… lol. We really do need to cater to the audience! I need to break up my content more. Sometimes I get on a roll with my writing and forget to make it skimmable! I hear you Bev… many of my posts are quite long too and it depends on the post and the person. Some may read all of mine and some don’t. That’s just the nature of the beast. But if we break it up, we aren’t going to lose those who DO read it but may gain those who don’t read everything. Win win. I understand also though, if you are guest posting, you may be limited but there are always options. What? They’re not reading my whole blog? Tell me it isn’t so! Okay, now that I’ve calmed down, I’ll admit you’re right and I need to make sure this applies to all my blog posts, not just some. Thanks for the kick in the pants! Great tips! I tend to like photos, bullets and numbering lists to tell a story on my blog. It helps me explain without too many words. I think of my blog more like a magazine. I want people to come back over and over and lookup tips for areas they are having issues with and be able to get inspiration so they can run with it. First of all, you know that I’m LOVING the infographic, had to Pin that one! 🙂 As for making your writing skimmable, it’s a MUST these days. In a phrase: short attention span! lol We have a content analysis tool that runs on our site to see how far/how much our visitors read on our blog pages. The articles with less text (or less crowded text) and visuals do much better. As always, great tips! YAY! Thanks Meggie, thought of you when I was doing the infog! thanks! I think skimmable is key. People don’t have time to sit down and read lots of pages, they come to skim and if it interests them they stay. Great tips! Thank you Cindy, yes, so true! This makes perfect sense. That’s why I add pictures with every post that I publish just to make things a bit more interesting for the readers. At least they get the general message, right? OMG.. great job Elizabeth… at least 1 pic per blog, great job! I so AGREE and yes, I’m guilty of it too. What a great post this is lady! It has never occurred to me even in a brief moment to make my blog skimmable. The good news is, I’ve been a professional writer since 1996 (started int he corporate world) so I’m programmed to sectioning, bolds, bullets, etc. But now that I think about it, I really only format for skimmability, or to stress something for my clients. You have reminded me I need to be doing this for me too! I thought mine were and I have been doing better over the last year. My other issue was talking OVER my audience so I have gotten better at that too! Yes.. do it! Thanks! Kristen nails it with her skimmable content. And she’s right! I have spent quite a bit of time working on the look of my website. I want the site to be readable and look good. So glad to hear that Heather! It is important! Very good advice that I think sometimes we forget! I do focus a lot on my pics, so this will be a great goal to achieve. I may even go back through some of my older posts and edit 🙂 Thanks for the suggestions and tips. Thanks Molly. Glad you add pictures, so many don’t do it! I am actually going back through my older ones as I add new ones too!